Often you can find me running workshops and lecturing in formal and informal sectors of UK education, I work as creative practitioner, community artist and masterclass presenter. I specialise in Songwriting, band and artist development and music business. With artist development deals being a very rare thing nowadays, there are a lot of young creative artists, songwriters that have the potential but need the guidance in achieving their goals quicker and with higher quality. With the basics being capability of playing an instrument/singing, understanding of music theory, music business, creating a certain level of confidence there is so much more to the process of defining oneself . Once the basics are there I feel that my main role is to help the artist in their soul searching journey, defining what they are and subsequently creating their own sound palette, their own image palette, their choice of stylistic language in lyric writing, their cause and message. It is a process of constant development, sometimes even redefinition of oneself but when the artist gets it right it is worth all the effort. Understanding music business is an absolute must if you are serious about your career. Often seen as the “difficult part” about the career, I find it so important to make the knowledge and information accessible, current and relevant. It is no good to talk in a very complicated way if someone leaves the sessions not being able to take anything with them. From understanding your rights and obligations when entering contracts (from a simple vocal release to a potential record deal) artist/songwriter/musician/DJ etc has to be able to communicate effectively on all levels of music industry. In my workshops the main accent is about establishing a good level of knowledge, know how and practical ideas of furthering ones career effectively. I lecture at the Kidderminster College and also I do workshops and presentations in FE and HE level including such subjects as Self Promotion 101, How to build and keep music industry connections, Bands to brands- a path to sponsorship, How to gain a work as a session player, Media Training, Songwriting. 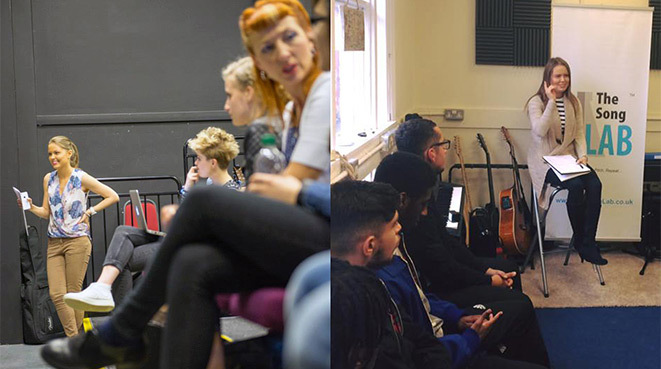 You will often find me running workshops also from the SongLab based on various music business and songwriting subjects involving the very young and talented artists from the West Midlands. Mas records is a funded FE level music course that is based around the artists development for 16-18 year olds. If you are interested make sure you get in touch via SongLab.co.uk page. We also run a Youth Music’s funded project “Positive Labels Birmingham” in Partnership with Make Some Noise for 13-19 year olds. We use songwriting and music making a medium to boost self esteem and confidence levels in young people. 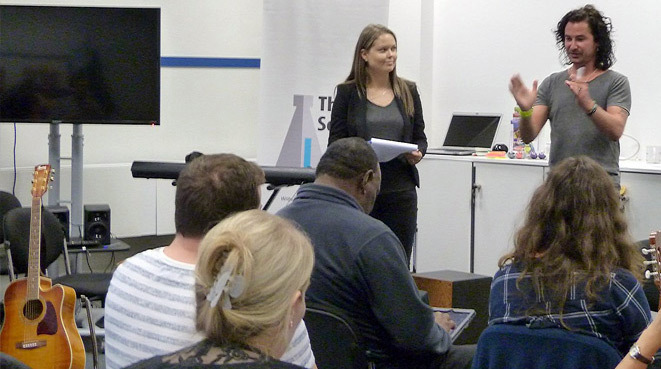 Songwriting is often found to be a great tool to engage with young people and so together with my co-director of the SongLab Jonny Amos we have created an informative and practical training program for music practitioners and teachers that are looking to use songwriting as one of the methods of further musical development of their students. This has been very well received and we have gained feedback that the methods and techniques shared have been easy to implement in everyday schedule and that it is an inspirational training course. Music can be a very personal thing and yet it can also be very social in it’s manifestation – music making is an excellent medium for social and personal development that can be transferable and used across numerous sectors. Learning more about ourselves, from effective communication to team playing, assertiveness and decision making – music can take people on life changing journey. Songwriting in this setting can be a great way to start a conversation with young people. Through the activity of songwriting young people can open up about issues that often they might find it difficult to talk about. Themes of belonging, self worth, problems around being bullied, found and lost love, family often come up and through years of experience and feedback we have learn that it is a very valuable tool to let go of some emotions, to express oneself and find new coping mechanisms. Band building is often used as a activity type in community music so I often would co-deliver band building when working with LAC and Young Carer groups. I often also travel to independent new bands that need extra help with their music arrangements and just merely being pointed in direction of better stage presence, gear control and overall set list. There are a lot of young fantastic musicians that are skilled but might not have the experience in playing in a band.Being in a band is an art form where you need to first of all being able to play and interact musically, but also it is about being able to build strong relationship that could potentially work for many years. I really enjoy working with young talented musicians and artists so every now and again I might take on a new student. Most of my students come to me for help with their songwriting, singing or guitar playing, as well as business and music theory related queries. As a creative music practitioner I can also offer accreditation to the people I work with, the accreditation include Arts Awards (Discover, Explore, Bronze, Silver, Gold) as well as AQA and RSL. I am proud to be involved in the work with: Make Some Noise, Quench Arts ,The Hive, Mac Makes Music, Youth Music, Kidderminster College, S4E (Services for Education), Recovery College, City of Birmingham Symphony Orchestra (CBSO).